Visitors to the Sabi Sand Game Reserve in South Africa now have a new accommodation option — if you’re flush with cash, that is. The luxurious Tengile River Lodge is a contemporary-designed property by the banks of the Sands River, featuring nine thatched suites each with their own lap pool and deck looking out on river and forest surroundings. And since you’re in a safari reserve, you never know which animal neighbors you’ll end up stumbling upon. Offering some of the largest rooms in the Sabi Sand, with 2,150 sq ft of sprawling space for each suite, the lodge is designed with materials from the area’s past, including stone from the Selati Railway in its terrazzo floors. Since it’s run by conservation-focused travel company &Beyond, the lodge advocates sustainability as well, with repurposed material used in its structure, such as stone cladding from a local quarry and rooftops covered in sand from the site. It claims to use top-notch waste water and sewer treatment systems too, alongside Earth-friendly elements like thermal efficiency to leave a nominal ecological footprint on the land it sits on. Local designers have also been brought in to add a South African touch to the lights, couches, beds, and chairs, with the curtains and upholstery featuring wildlife- and nature-patterned fabrics hand-painted by Cape Town artists. The animal prints make an appearance throughout the lodge as well, stamped on the building’s earthy hues that do their best to blend in with the surrounding colors. 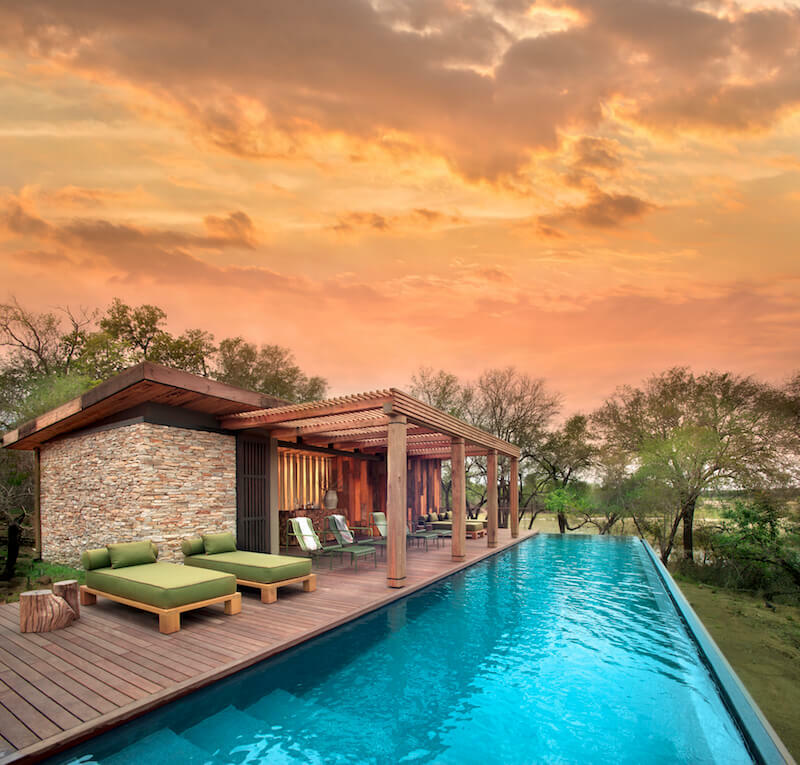 Those determined to relax and unwind in between game drives and bush walks can make full use of the wellness centre with a gym and a pool that overlook the river, as well as facilities like a spa and a lounge space for some quiet time. If you’d rather be pampered than rough it out budget-style, rates here start from ZAR 20,500 (US$1,482) per person, per night.